One of the challenges of talking, writing, consulting, or teaching about IO Psychology is the difficulty that lay people (i.e. company stakeholders, students, my parents and family) have in understanding the value of what we bring to the workplace. I often try to use films and TV shows as examples. My closest friends know that I love films and television. My wife and I enjoy going to the local multiplex to see what’s playing. We recently watched Hidden Figures, a terrific film about Katherine Johnson, Dorothy Vaughan, and Mary Jackson and their work at NASA. The film illustrated their difficulty in being noticed by the establishment at NASA during the space race. During this difficult time when the United States needed all the science and engineering talent it could muster, those in charge at NASA seemingly ignored these individuals because they were African-American and female. Kevin Costner, Kirsten Dunst, and Jim Parsons play three supervisors in the film and as I was watching I was flabbergasted by each character's’ decision to discount the evidence of their own eyes. Each of these supervisors lessened what they saw in their employees’ positive work performance. Paul Stafford (Jim Parsons) and Vivian Mitchell (Kirsten Dunst) both ignored high quality performances because of demographic characteristics. The first such example in the film is that of Dorothy Vaughan (Octavia Spencer) who had spent a year working as a supervisor and yet could not receive the official designation and title. Vaughan had obviously excelled and succeeded in the role but her supervisor, Vivian Mitchell would not budge on the issue of her promotion. Katherine Johnson fared no better. As a woman who excels at math and science she is subtly ignored by men in the workforce due to gender stereotypes. Add her status as an African-American to the mix and no wonder she’s often ignored by the other staff members in the NASA computing division. While these actions are perhaps more prominently delineated because this is a PG-rated Hollywood family film taking place during the racially charged 1960's, the underlying idea rings true. While such explicit bias isn’t as common in the modern era I wonder how often subtle bias affects managers and decision makers in talent management. Perhaps it's not even bias but organizational politics or an inability to see what’s in front of us. Imagine looking at Lebron James and saying “he’s not good enough for my team” or looking at Stephen Hawking and saying “he’s disabled, I don’t think he can do physics research.” The film illustrates the active process by which those in authority can ignore true talent even if it sits in front of them. As an IO Psychology practitioner, a professor, and a consultant I treasure the truth. Watching Hidden Figures reminded me how far people can sometimes go when it comes to ignoring the truth. There are social, cultural, and political reasons why this happens. We see these distortions in the form of commonly held stereotypes. Stereotypes that continue to threaten potentially talented individuals from pursuing leadership roles, pursuing STEM careers, or even envisioning their own ability to achieve. As a social scientist, a teacher, and a consultant I cannot allow these types of untruths to continue unabated. We need to stand up for the truth which is that qualified individuals of every demographic category need opportunities to succeed. If we commit to this as a field and as a community then we can start to honestly address these issues and design interventions and solutions that allow organizations to thrive while allowing people from diverse backgrounds to succeed. Science is about striving to look for the truth and in IO psychology we try to identify the truth in people’s abilities and design solutions to put people in the right jobs where they can succeed. If human judgment, intuition, and gut instinct have multiple issues then what can be done? Just like with any other decision in life, a decision about promotion, selection, and termination should be made using tools. Tools before the days of IO psychology included asking a friend or seeking out an expert, perhaps getting a recommendation. In the age of the internet and the mobile device think about the last time you made a decision about where to eat, what to buy, or who to date without referencing Yelp or Amazon reviews (Aziz Ansari writes about this process quite beautifully in Modern Romance). IO Psychology and Human Resources Management research have helped the talent management field generate several tools that can be used for the process of selecting, training, promoting, and managing an employee. There are so many tools out there in the modern era that the process of ignoring a talented employee because of gender, race, or religion seems unfathomable. Yet it continues to happen. As a front-line, mid-level, or hiring manager you have the power to use these tools to make better decisions. Here’s some general advice about how to avoid missing out on hidden talent. Discuss the job requirements with your HR and recruiting teams. In the selection process make it clear to your HR and recruitment teams what you’re looking for. Be sure to include the results of a job analysis so that the requirements of the job are clear to all involved in the hiring process. Use psychometrically valid tools that assess the job requirements. Make sure that the tools that you’re planning on using measure the real job requirements. If your organization uses an observation checklist then make sure that observers are looking for those behaviors that are actually part of the job that lead to organizationally valued results. If your organization uses a work sample test or an interview make sure that those tools assess the necessary skills for the job. Make sure that your organization knows how to use these tools as well. Ask consultants or test developers about how these tools ought to be used. Reflect on your processes. Even if your organization has matched job requirements to hiring and performance appraisal systems, it’s important to look at the organization as a whole. Are there gaps that exist in your organization in terms of diversity? Does your organization promote diversity effectively. Without an honest self reflection organizations can have situations of disparate impact Even psychometrically valid tools are built by humans and can sometimes have bias built into them inadvertently. If you don’t reflect on these processes you can miss errors that are being made. Recognize that the process is iterative. You and your organization may not get it right straight away. The goal is to keep working towards developing fairer hiring and promotion practices because these practices do lead to better business results and create a more just world. Finally, I want to leave you with a reminder that even if you do put in your due diligence you might miss top talent. Remember Tom Brady was drafted in the 6th round of the NFL draft. Those teams didn't miss his talent for lack of trying. As HR, IO Psychology, and talent management professionals it’s up to us to stay committed to searching for talent everywhere so that our organizations can be more effective and bring about a more just world. 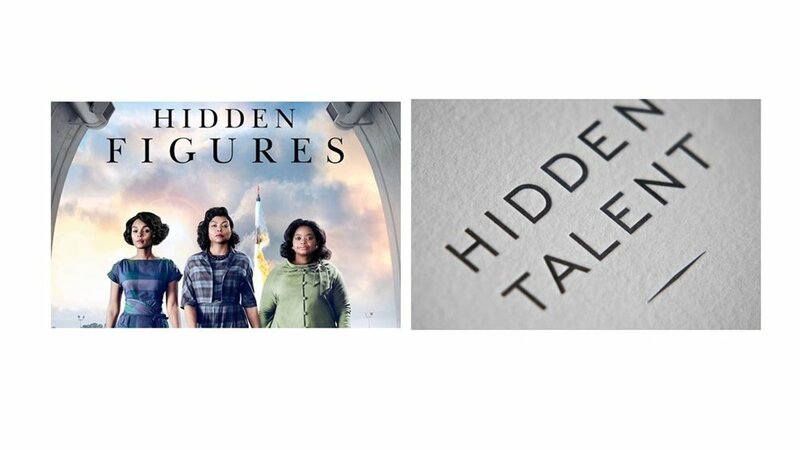 The lesson of Hidden Figures isn't that talent was hidden but that it was ignored.